Deadly bacterial biofilms that colonize on surfaces and infect the human body have mystified clinicians and scientists for years. Resistant to many conventional antibiotics, these biofilms result in more than 500,000 deaths a year worldwide. Now researchers at the University of Florida have developed a novel compound that uniquely starves biofilms of iron — a nutrient critical for growth and development. Biofilm communities are highly complex and consist of bacteria that attach to surfaces and grow very slowly, or not at all. They are encased in a protective coating of DNA and proteins and resist most antibiotic treatments. For bacteria to successfully establish an infection in the human body, iron must be obtained from host tissues. Iron signals biofilm development, supports energy metabolism and stabilizes important protein structures. 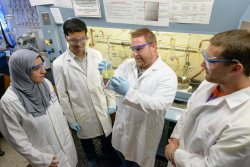 UF researchers discovered their compounds induced rapid iron starvation through a series of experiments using novel compounds known as halogenated phenazines, or HPs. These marine-inspired synthetic compounds were developed in 2015 and have been shown to kill dangerous bacterial biofilms present in recurring and chronic bacterial infections, such as methicillin-resistant Staphylococcus aureus, or MRSA. Using RNA-sequencing technology, more than 2,700 genes in a MRSA biofilm were evaluated upon exposure to the HP-14 compound at one-tenth its killing concentration. About 200 genes were found with changes in their expression profile. Additional tests with the same concentration and varying lengths of exposure time helped researchers narrow the group even further to four unrelated genes that function differently to acquire iron for the bacteria. All four genes shared a common bond — they were rapidly activated from the treatment of HP-14, but not other iron-binding molecules. Huigens said this study, published in the journal Angewandte Chemie, helps piece together a larger puzzle with the genetic understanding of how the HP compounds work. By knowing how bacteria rely upon iron for growth and development, scientists can focus their attention on developing compounds that starve biofilms of their iron supply.